The financial crisis has caught up to contemporary Chinese art. After a boom cycle in 2007 and 2008 that led many young works to sell for multiples of their original sale price, prices are beginning to fall: In fact, Chinese auction house Beijing Poly International Auction says business has dropped by about 50 percent. Join the galleries of Georgetown this coming Friday for the launch of "Georgetown Gallery Gaze" every third friday from 6-8 for a movable feast of art, music and libations throughout Georgetown. Maps and details with the 13 participating venues are here. Don't miss Cross Mackenzie's show, which has two local ceramic artists, Matthew Frietas and Tamara Laird. 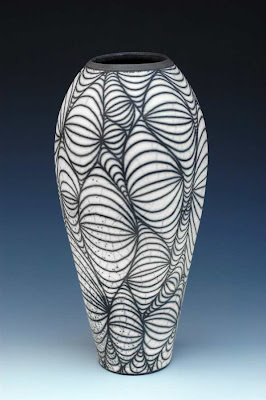 In his "Naked Raku Vessels", Freitas takes the ancient Japanese Raku firing technique "into the modern era with his dizzying designs. Each Raku vessel is unique, the cracks formed by the process of removing a piece from the kiln while still red hot and submerging it in a container filled with leaves or paper. A fire is ignited and the resulting smoke drenches the vessel and seeps into the cracks. The challenge is to balance control and serendipity. The degree of mastery Frietas demonstrates over what is essentially a capricious technique is what makes these pieces so impressive. He cuts through a layer of slip, which acts as a resist, and he draws with the smoke. In the 16th century, this unique firing method was more than a new approach to ceramics. It was a part of a lifestyle in which Zen ideals were paramount - expressed in ceramics by creating objects that appeared born of the earth. This is where Frietas parts with the tradition. Though his Raku is low fired and has the texture of something found in nature, his patterns are uniquely man made and dazzling." Tamara Laird's "Paisley Monuments" are on view through October 12th at the United States Botanic Gardens in an exhibition called "Flora: Growing Inspirations". The show will bring these large vitrified glazed ceramic sculptures indoors for Cross MacKenzie's next exhibition. Laird's current work is based on the paisley motif, a universally recognizable pattern that has been used for thousands of years. Like Frietas, she looks to tradition as a point of departure and creates new and original works.